What’s in my Mailbox | What does it mean to be donor-centered? I recently opened a newsletter packet sent from Mercy Corps, a Portland-based organization I’ve spotlighted a handful of times in the past. Mercy Corps is renowned, established, and they’ve got a global reach. Their mission involves the fight against poverty, and through their work, they’re bridging economic gaps around the world by investing in and providing opportunities to those who lack the resources to improve their lives. Consistent with the many communications I’ve received from Mercy Corps, both email and direct mail, each component of this packet truly speaks for itself, and I’ve included all of the pieces below. So what immediately caught my attention as far as this latest installment? I’ve highlighted some of its selling points below, but there are plenty more where these came from. And also worth mentioning is their use of World Refugee Day, which further bolsters their need and adds an extra note of urgency. 1. The accompanying personalized letter. This letter speaks directly to me, the donor, and focuses on what my gift makes possible. Ah, good old “money in action.” I’ve been referencing it a lot lately because I feel strongly about it. Specificity motivates repeated giving. It’s not always enough to just know that my money is helping to alleviate poverty. I wholeheartedly approve seeing it taken a step further. If an organization communicates to me that my money is being used to solve problems and create a certain kind of positive change, I feel more than just grateful. I feel inspired. 2. 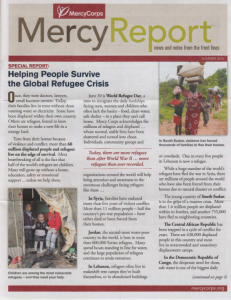 Full-color four-page newsletter, entitled Mercy Report. Through detailing many different kinds of strife happening around the world, including Justine’s story involving her struggle to bring water to her family, the need to give is firmly established. But there’s also a balanced equation created: this is what’s happening, this is how you’ve been helping, and this is why we need more of your help. 3. A scattering of donor-focused headlines: Thanks to you, safe water comes to the Democratic Republic of Congo. A Reason to Hope, How you help children reclaim their future. Columbian teenagers at risk: you’re their lifeline. 4. Charlotte’s story. Mercy Corps has place the spotlight on an individual donor (a seriously cool kid) and her short narrative is packed with an abundance of hope inspiration. Can you believe she’s only eight years old?! 5. Two response devices. There’s one included as a stand-alone, and there’s one attached inside the newsletter, right below Charlotte’s story. The first is perfectly personalized and the second is perfectly placed. It follows the entire equation that communicates, in no uncertain terms: this is why we need YOU. 6. The envelope. This piece did more than simply survive my daily mail sorting and avoid the garbage can. Mercy Corps added a message to the outside of the envelope to tell me that my newsletter was inside. My interest was piqued and I really wanted to read the newsletter, and so I prioritized their mailing. Beyond this handful of details, what else, if anything, has caught your attention when it comes to this packet? Have you recently stumbled on a nonprofit newsletter that inspired you for one reason or another? I’d love for you to share it with me. Addendum: In Tom Ahern’s recent newsletter, he asks “Is it best practice to thank, report AND ask in your donor newsletter?” And responds emphatically with “One expert says NO! I say, YOU GOTTA!” Here’s the thing about true donor-centered fundraising that I repeat over and over again to clients, students and subscribers: This work is a mindset. You must get it straight in your head that you’re not begging for dollars. You’re offering your donors an opportunity to change the world. And when you DON’T ask, you’re depriving them of that opportunity.